By Johnny Benz, Doghouse Boxing - Boxing Promoter Oscar De La Hoya had plenty to tweet to his followers on twitter over the Holiday season. De La Hoya had words of inspiration and plenty of well wishes for his fans. De La Hoya addressed that last year was a difficult one, but is hoping for a better year in 2012 by living one day at a time. On his verified twitter account, De La Hoya tweeted: "2011 was a very difficult year for me. But it's going to be the best year of my life.I am now in the present living life 1 day at a time." 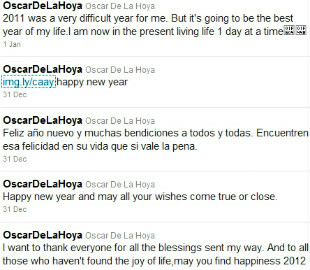 De La Hoya also tweeted: "Happy new year and may all your wishes come true or close." You can read more of what Oscar Tweeted by checking out the screen grab of his tweets on this page.